Hone your digital photography skills in a picture-perfect part of the world. 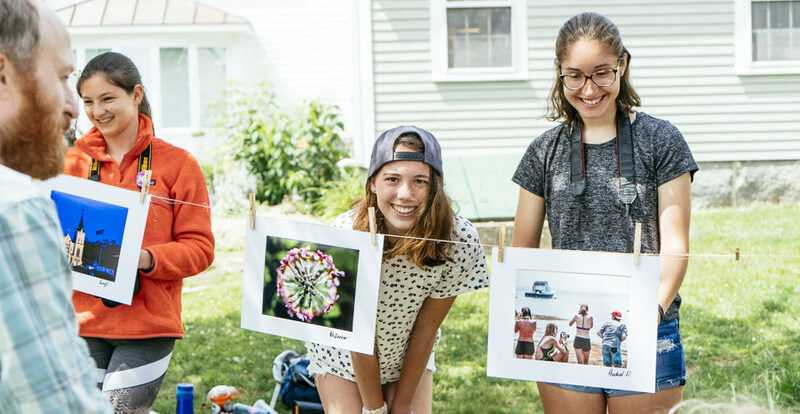 Using Maine’s beautiful outdoors as your backdrop, you and your group mates will collaborate, create, and edit memorable photos together under the watchful eye of our professional photography instructor. No experience is necessary – over eight days, you’ll learn, practice, and discuss the basics of digital photography. Your final portfolio may include anything from rugged landscapes, to portraits of your peers, to coastal wildlife. Amid your photography sessions and visits to quaint coastal towns, your group will also take time for meaningful community service, coastal hiking, beach-combing, and sea kayaking. You’ll leave the trip with great new friendships, a heightened understanding and appreciation for photography, a digital portfolio of your images, and a professionally printed and framed piece of your work. 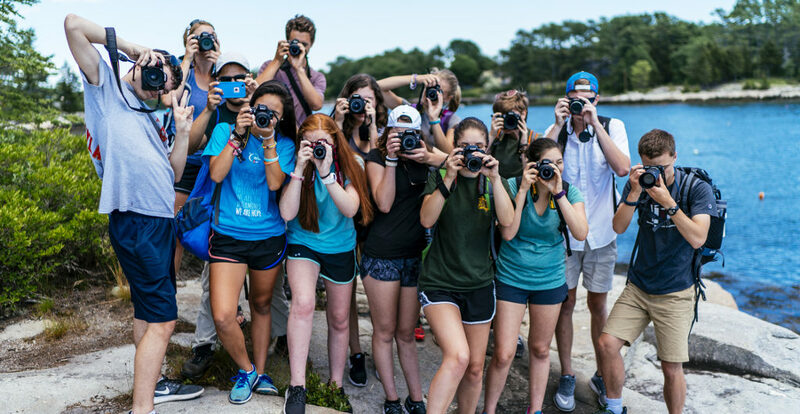 From our home base in the quintessential coastal Maine town of Boothbay Harbor, we’ll split our time between learning the nitty-gritty of digital photography with our professional instructor and exploring the stunning surrounding area with our cameras. Capturing classic Maine sights and scenery – lobster traps, rocky coastlines, and iconic lighthouses – we’ll experiment with apertures, shutter speed, lighting, and more. We’ll focus (no pun intended) on editing and individual photos while simultaneously collaborating in the analysis and feedback process. In addition to playing games and cooking as a group, we’ll spend much of our days on walks that highlight the beauty of Maine’s summertime splendor and exploring the bustling towns and working waterfronts nearby. 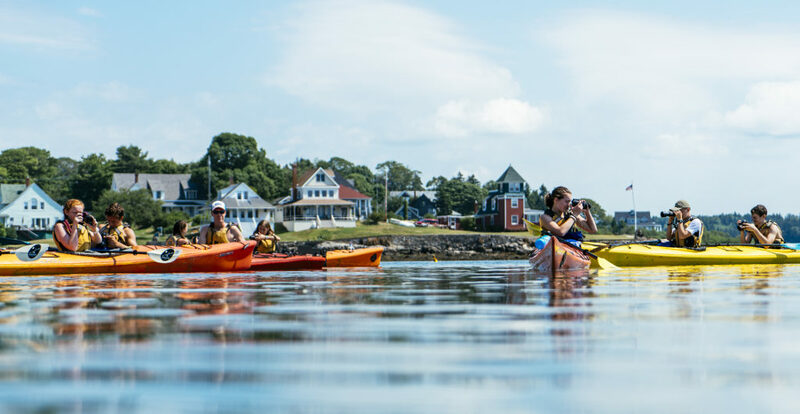 Our adventures include sea kayaking along the rocky coastline of Casco Bay and taking a ferry to the famed Monhegan Island, where we’ll spend the day trekking along rustic trails and photographing wild beaches, abandoned bridges, and authentic Maine life. We’ll also take time to give back to the trails we’ve been exploring through a rewarding project with a local land trust. As with all of our trips, Apogee believes that outdoor activity sparks inspiration, wonder, and creativity. Maine offers the perfect opportunity to take newly learned technical skills and physically apply them to a beautiful and complex setting – all with the support and collaboration of a professional photography instructor, outstanding trip leaders, and a group of great new friends. Together we’ll learn to think about photography differently, push our limits, and learn from one another. Finally, we’ll have a chance to proudly showcase our work to the Boothbay Harbor community with a public Final Photo Exhibition. After a celebratory dinner in town together, we’ll bid each other adieus and head home with great memories, new friends, and final photo prints from the last 9 days together. Given a rating of Challenge Level 2 (out of a maximum of 10), we consider the physical aspect of MCP to be very accessible to any moderately fit, motivated student. The focus of the trip will be on photography, but students will also engage in short hikes, sea kayaking, and a hands-on service project with a local land trust organization. While the physical challenge level of this trip is low, students should come prepared to be challenged intellectually, focus on their photography, and learn new skills. Please note that all of Apogee’s Challenge Levels are not scientific and are subjectively calculated by the Apogee staff. What are the accommodations like on MCP? There is no camping on our MCP trip. Instead, our MCP groups will be staying in rustic yet comfortable indoor accommodations in Maine’s mid-coast area. These accommodations will have regular access to electricity, running water, and secure storage for electronics and camera equipment. Students will sleep in beds and will be able to shower daily. The specifics of our community service projects and the number of hours we volunteer varies slightly from year-to-year. In the past, we have worked with the Boothbay Harbor Land Trust on a variety of tasks including invasive species removal, trail clearing and maintenance, etc. Students can expect 3-5 hours of community service work over the course of our trip, usually in a single day. You can expect to receive a phone call from your child once during their MCP trip, usually around the halfway point. Please note that Apogee staff members do not travel with students; our trip leaders will already be in Maine on arrival day and will stay in Maine after the trip ends. Apogee staff and trip leaders will have a detailed flight itinerary for each student who is flying to the trip start and will be at the airport to greet them on arrival. Once students are with their leaders, they will call home to let their parents know they have arrived and are with their group. Please see our blog post for specifics regarding students traveling as Unaccompanied Minors. Further, we encourage you to coordinate travel with other attendees; we’re happy to put you in touch with other enrolled families from your region. We will provide enrolled families with a Travel Information document covering details specific to traveling to and from Maine, including airport information and arrival and departure time windows. Please contact Apogee with any specific questions or concerns regarding drop-offs and/or pick-ups. Apogee’s tuition costs are meant to be all inclusive and include all meals, accommodations, and activity fees. The most significant additional expenses on our Maine Coast Photo program will include travel to and from Maine, a camera, and a laptop. Does my child need to bring their own camera equipment? The short answer is yes. Enrolled students will receive an equipment list that will provide all of the details. In brief, students will need to come to the trip with a digital camera that, at minimum, has the ability to independently control shutter speed, lens aperture, and ISO speed rating. Most point-and-shoot cameras have these basic features. (If you’re not familiar with these features – don’t fret! Any place that sells cameras, even online retailers, can tell you if a camera can do this.) You’ll need to bring an extra camera battery and your charging cord. Additionally, we ask that students bring a laptop and any cords and/or memory cards needed to connect the camera to the laptop. Students will also need a way to download the images from the camera to their computer. This can be done with a cable and/or memory card reader. Please make sure you have the appropriate cord and/or card reader to connect your camera to the computer. Our photo instructor will show students how to download the chosen editing program, pixlr.com or PhotoScapeX, both free programs, upon arrival. Please contact the Apogee office with any follow-up questions about these items.